It is with sad irony that the company which invented “planned obsolescence” — the decision to build cars that would fall apart after a few years so that the customer would then have to buy a new one — has now made itself obsolete. It refused to build automobiles that the public wanted, cars that got great gas mileage, were as safe as they could be, and were exceedingly comfortable to drive. Oh — and that wouldn’t start falling apart after two years. GM stubbornly fought environmental and safety regulations. Its executives arrogantly ignored the “inferior” Japanese and German cars, cars which would become the gold standard for automobile buyers. And it was hell-bent on punishing its unionized workforce, lopping off thousands of workers for no good reason other than to “improve” the short-term bottom line of the corporation. Beginning in the 1980s, when GM was posting record profits, it moved countless jobs to Mexico and elsewhere, thus destroying the lives of tens of thousands of hard-working Americans. The glaring stupidity of this policy was that, when they eliminated the income of so many middle class families, who did they think was going to be able to afford to buy their cars? History will record this blunder in the same way it now writes about the French building the Maginot Line or how the Romans cluelessly poisoned their own water system with lethal lead in its pipes. So here we are at the deathbed of General Motors. The company’s body not yet cold, and I find myself filled with — dare I say it — joy. It is not the joy of revenge against a corporation that ruined my hometown and brought misery, divorce, alcoholism, homelessness, physical and mental debilitation, and drug addiction to the people I grew up with. Nor do I, obviously, claim any joy in knowing that 21,000 more GM workers will be told that they, too, are without a job. But you and I and the rest of America now own a car company! I know, I know — who on earth wants to run a car company? Who among us wants $50 billion of our tax dollars thrown down the rat hole of still trying to save GM? Let’s be clear about this: The only way to save GM is to kill GM. Saving our precious industrial infrastructure, though, is another matter and must be a top priority. If we allow the shutting down and tearing down of our auto plants, we will sorely wish we still had them when we realize that those factories could have built the alternative energy systems we now desperately need. And when we realize that the best way to transport ourselves is on light rail and bullet trains and cleaner buses, how will we do this if we’ve allowed our industrial capacity and its skilled workforce to disappear? Thus, as GM is “reorganized” by the federal government and the bankruptcy court, here is the plan I am asking President Obama to implement for the good of the workers, the GM communities, and the nation as a whole. Twenty years ago when I made “Roger & Me,” I tried to warn people about what was ahead for General Motors. Had the power structure and the punditocracy listened, maybe much of this could have been avoided. 1. Just as President Roosevelt did after the attack on Pearl Harbor, the President must tell the nation that we are at war and we must immediately convert our auto factories to factories that build mass transit vehicles and alternative energy devices. Within months in Flint in 1942, GM halted all car production and immediately used the assembly lines to build planes, tanks and machine guns. The conversion took no time at all. Everyone pitched in. The fascists were defeated. We are now in a different kind of war — a war that we have conducted against the ecosystem and has been conducted by our very own corporate leaders. This current war has two fronts. One is headquartered in Detroit. The products built in the factories of GM, Ford and Chrysler are some of the greatest weapons of mass destruction responsible for global warming and the melting of our polar icecaps. The things we call “cars” may have been fun to drive, but they are like a million daggers into the heart of Mother Nature. To continue to build them would only lead to the ruin of our species and much of the planet. The other front in this war is being waged by the oil companies against you and me. They are committed to fleecing us whenever they can, and they have been reckless stewards of the finite amount of oil that is located under the surface of the earth. They know they are sucking it bone dry. And like the lumber tycoons of the early 20th century who didn’t give a damn about future generations as they tore down every forest they could get their hands on, these oil barons are not telling the public what they know to be true — that there are only a few more decades of useable oil on this planet. And as the end days of oil approach us, get ready for some very desperate people willing to kill and be killed just to get their hands on a gallon can of gasoline. 2. Don’t put another $30 billion into the coffers of GM to build cars. Instead, use that money to keep the current workforce — and most of those who have been laid off — employed so that they can build the new modes of 21st century transportation. Let them start the conversion work now. 4. Initiate a program to put light rail mass transit lines in all our large and medium-sized cities. Build those trains in the GM factories. And hire local people everywhere to install and run this system. 5. For people in rural areas not served by the train lines, have the GM plants produce energy efficient clean buses. 6. For the time being, have some factories build hybrid or all-electric cars (and batteries). It will take a few years for people to get used to the new ways to transport ourselves, so if we’re going to have automobiles, let’s have kinder, gentler ones. We can be building these next month (do not believe anyone who tells you it will take years to retool the factories — that simply isn’t true). 7. Transform some of the empty GM factories to facilities that build windmills, solar panels and other means of alternate forms of energy. We need tens of millions of solar panels right now. And there is an eager and skilled workforce who can build them. 8. Provide tax incentives for those who travel by hybrid car or bus or train. Also, credits for those who convert their home to alternative energy. 9. To help pay for this, impose a two-dollar tax on every gallon of gasoline. This will get people to switch to more energy saving cars or to use the new rail lines and rail cars the former autoworkers have built for them. Please, please, please don’t save GM so that a smaller version of it will simply do nothing more than build Chevys or Cadillacs. This is not a long-term solution. Don’t throw bad money into a company whose tailpipe is malfunctioning, causing a strange odor to fill the car. 100 years ago this year, the founders of General Motors convinced the world to give up their horses and saddles and buggy whips to try a new form of transportation. Now it is time for us to say goodbye to the internal combustion engine. It seemed to serve us well for so long. We enjoyed the car hops at the A&W. We made out in the front — and the back — seat. We watched movies on large outdoor screens, went to the races at NASCAR tracks across the country, and saw the Pacific Ocean for the first time through the window down Hwy. 1. And now it’s over. It’s a new day and a new century. The President — and the UAW — must seize this moment and create a big batch of lemonade from this very sour and sad lemon. Yesterday, the last surviving person from the Titanic disaster passed away. She escaped certain death that night and went on to live another 97 years. So can we survive our own Titanic in all the Flint Michigans of this country. 60% of GM is ours. I think we can do a better job. He makes some great points, though I’m not crazy about a $2.00 tax on a gallon of gas. That lets the rich keep on driving while middle income and poorer folks feel the brunt of a changeover. The times have changed though and as an ex-auto tech I can say with some authority that GM has nobody to blame but themselves. They used to make a fine automobile, I know because I’ve owned at least 20 of them. Even the Beach Boys wrote songs about things that meant something to us like Chevy’s Hot Rod engine the 409. When was the last time someone wrote a song praising anything by GM? OK Bob Seger wrote Like a Rock, but I don’t think Chevy commissioned Brain Wilson to pen 409. In the early 70’s Chevy started cranking junk like the Vega. Ford had it’s version of the Bic Lighter of cars too with the Pinto, but this was in my opinion, the beginning of the end of the American automobile. My Mom bought a brand new Chevy Malibu in 1981 and it was the biggest pile of junk EVER! Everything broke on it (EVERYTHING) and the topper was it didn’t even come new with a Chevy motor, they were putting Buick engines in them. I feel bad for all of the people who lost jobs, homes, savings & cities just because a once proud company chose planned obsolescence over a quality product. Hopefully those folks can turn their lives around and become proud again too. Yeah, I still own a 1958 Impala, though I don’t drive it much because that old Toyota with almost 300,000 miles on it still passes a smog check no problem while getting great mileage to boot. I’m looking forward to owning an electric car some day though, that is if we can get off our duffs and start making a quality one or two. Dave- you’ve got a way with words! The Bic Lighter of cars… priceless! I had a great marriage……….20 of them! Moore’s ideas make a lot of sense to me. We should keep GM employees on the job, but move them on to more productive work. And I like the idea of starting with a national high-speed train network. We’ve got millions of people who need work…let’s put them to work, in projects that benefit us all. I cant wait to see or hear the right wing response to Moore’s ideas: Obamanism is the new socialism, we can build hummers that get 20+ mpg, etc, etc. 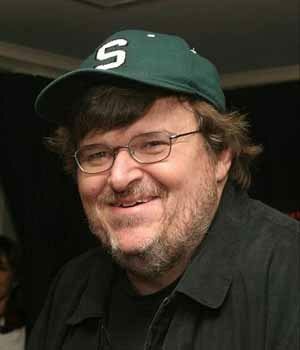 High profile progressive thinkers, like Michael Moore (well, maybe not someone as universally despised by imprisoned thinkers as him…) should be brought together for panel discussions with the suits in order to come up with the best solutions. General Motors = General Malaise. I drive a mazda for a reason – but I would gladly hop in an American made car if I knew it would get me to and from work on a regular basis. Unfortunately right now, that just isn’t true. DG – my dad still gushes about the buick and chevy convertibles he drove in the late 50’s and early 60’s. When older generations talk about the cars they used to drive, you can really sense the love – its as if they are remembering a junior high sweetheart or something. I look forward to reminiscing the same way about my 2012 Chevy Volt. And please don’t get me started on Volkswagens, those old air cooled magnesium motors will burn brighter than the sun. Lane, I hope you get to reminisce about that too. I heard someone refer to GM as “Government Motors” today but because I owned an ’85 Jimmy that constantly broke down, I’ve been saying that GMC stands for Get More Cash for years, now it’s really true.